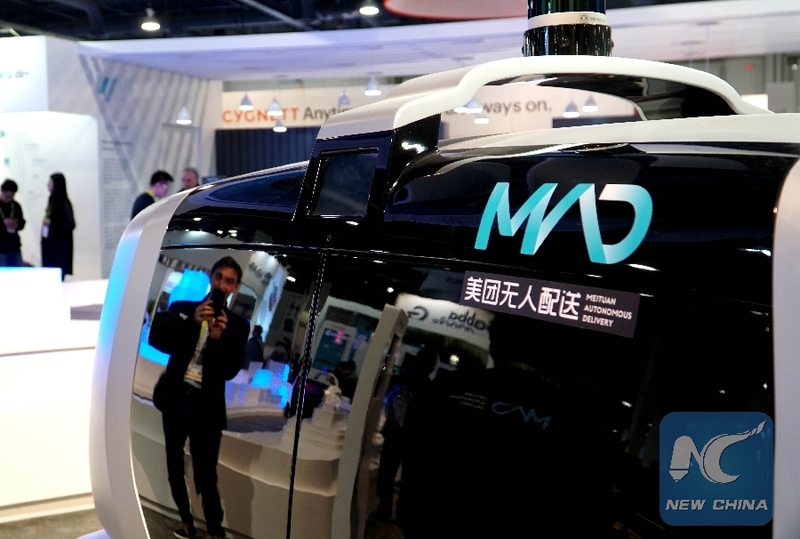 LAS VEGAS, Jan. 8 (Xinhua) -- As the annual Consumer Electronics Show (CES) kicked off here Tuesday, world tech companies are seizing the opportunity to boost cooperation with Chinese firms, eyeing the Chinese market, technology and talent. At a press conference before the opening of the CES, French automotive supplier Valeo announced its strategic cooperation with Meituan, one of China's leading on-demand food delivery platforms, and the two sides will work together on autonomous delivery vehicles. "The Chinese market is the biggest market in the world. So, we absolutely need to be present and to grow our presence in the market," Jacques Aschenbroich, chairman and CEO of Valeo, told Xinhua Tuesday. Pointing out the "upmost importance" of the Chinese market in electric cars, Aschenbroich said that currently about 15 percent of the company's global turnover in electric cars comes from China. "There are some new players that bring a new concept of mobility into the market and Meituan is one of those new players," Aschenbroich said, adding that they are "convinced" that the two can "take a leading position" in the market. Valeo is going to deliver droids using 48V mild hybrid technology to Meituan, the company said in a tweet earlier. Meanwhile, Meituan also signed strategic cooperation agreements with NVIDIA, a U.S. artificial intelligence (AI) computing and semiconductors company, and Icona, an Italian design company for the automotive industry. Eric Winston from Aristocrat Technologies, a Las Vegas gambling solution provider, told Xinhua that he has noticed the large presence of Chinese companies at the CES in recent years. Winston appreciated the flexible displays produced by startup Royole Corporation which is based in Shenzhen city, southern China. "Royole has been around for a short time, but they prove to have good quality products from what I understand," Winston said, noting that Shenzhen is a big producer of technology. The CES is the world's largest trade show and presents new products and technologies in the consumer electronics industry. At the CES this year, Royole released FlexPai, a flexible, foldable smartphone and tablet, with an ultra-thin display, drawing a big crowd at the exhibition hall. Winston said his team is doing their research to determine if it's a product that his company would consider integrating into their technology. As global tech firms make serious efforts to enhance their interaction with Chinese companies, the latter are also actively seeking worldwide partners and expanding the global market. Chinese PC giant Lenovo on Tuesday released a smart clock with Google, which responds to Google Assistant voice commands. It also released with Amazon a new pair of devices, a tablet and a charging station, which accept Amazon's Alexa voice requests. "Our cooperation with Google and Amazon are long-term strategic cooperation," Yao Li, vice president of Lenovo Consumer Tablets and Smart Devices Product and Business Management, told Xinhua. "This helps us tap into international markets such as the United States and Europe," Yao said. Lenovo, known for its hardware manufacturing, has seen the potential of cooperation between China and the United States on smart devices. "I believe China and the United States are the engines for smart living in the future," Yao said. "There will be great opportunities for in-depth cooperation with Chinese and U.S. technologies, which will benefit both Chinese and American manufacturers and customers," Yao said. For Li Chuangang, vice president of iFLYTEK, a Chinese company specializing in voice recognition, the opening-up and going global strategy is the best option. "The number of consumers determines the speed of the development of artificial intelligence technology, and more big data is certainly conducive to the development of our company," Li told Xinhua. At the CES, the AI tech-driven company unveiled its fully upgraded smart translator, an honoree of the CES 2019 Innovation Award. Besides exploring the U.S. market, the company has been looking to establish research partnerships with U.S. universities such as the Massachusetts Institute of Technology, Li said. "We hope to come out and communicate with everyone, and find some good partners in each country to jointly develop these good technologies," said Li. Research cooperation is also highly valued by Aschenbroich, whose company has already been working with universities in cities like Shanghai, Shenzhen and Wuhan in China. "I'm very, very impressed with what is happening in China, the leading companies and innovation, and the education of young engineers is very, very impressive," Aschenbroich said. "So that's the reason why we're increasing in different locations in China our R&D (research and development) footprint in order to really deal with the Chinese customers, Chinese universities and upgrade our competency in China," he said.